As a special offer to Mastercard Prepaid Debit (MP) card holders, Ryanair, will not apply an administration fee to those customers paying by this method of payment. 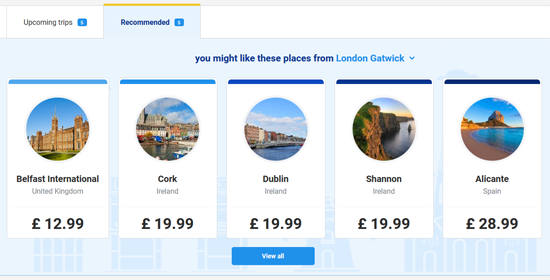 I am sure that the only reason for this prepaid Mastercard exception is that Ryanair can still advertise the fare excluding the fee, and it is probably the least common card type available. Anyway, over Christmas I was lucky to receive a gift voucher for use in a large shopping centre (Whitewater). This gift voucher is actually a prepaid Mastercard, so I decided to give it a try. Unfortunately, it did not work. I got a generic payment failure error instead of the page with my confirmation number and booking details. Perhaps this was related to the fact that I used my home address as the cardholder’s address, even though my address would not be associated with the card. I was tight on time, so I went ahead and booked the flights using my normal credit card. If I had more time I would follow it up directly with Ryanair. I have since read a very interesting thread describing how other prepaid Mastercard shopping vouchers have successfully been used. See Prepaid Mastercard No Loading or Purchase Charges (Works with Ryanair). I will try one of these the next time! It is getting close to that time of the year when we all start buying Christmas presents! I have not started yet, but more about this in a few weeks time! I have bought many things from Komplett in the past. I always found it good value, and I thought that the service was good. However, I have had two incidents in the past few months that are making me rethink this. In both cases I had to email customer service within 24 hours of ordering. In the first case my order actually arrived before customer service responded to me, telling me that my order would be shipped soon. In the second case I got billed several times for a single order, according to my online backing statement. They problem was acknowledged, and I was refunded, but again it took weeks. The other thing that is making me think about bringing my business elsewhere, is that Komplett charge me the Irish VAT rates. I consider these are excessively high, and hence I normally purchase from low VAT countries. I recently received a good recommendation for CafePress, so I decided to buy some t-shirts as presents during the week. I am delighted to report that my order arrived very promptly, and that I am very happy with it. I have fallen in love with a new eCommerce company! It is called Moo, and it prints all types of business cards! I received my MiniCards in the post today, and I am really impressed! They are so nice that I do not want to give them away! Like many Web 2.0 companies, Moo makes great usage of its blog and other popular social networking sites. I did not buy a single item in Ireland this year, and this was mainly due to the ridiculously high costs. I understand that part of this is due to the higher VAT on items in Ireland (see Online Shopping just got Cheaper), but I also think that retailers are still ripping-off consumers. Indeed, the most expensive single item I bought was a piece of Japanese electronics. The Irish price was over 50% more expensive than the price I bought it for abroad! I read two interesting articles in the paper earlier this week about Irish people and shopping online. Another interesting finding of the survey was that 90% of shoppers believe that they can save money by shopping online. I am certainly agree with this from my experience, and the recent increase in the Irish VAT rate has only exasperated the price differences! The full article is Shoppers spent average €1,700 online in 2008. The second article, Downturn speeding up revolution in the way we shop, argues that speed, adaptability, and agility, are the key business traits that will enable companies to survive the current economic downturn. The author then proposes that technology will be the key enabler of these business traits. It is interesting reading, and I share the author’s sentiments! I have a few female family members and friends who have all recently bought cosmetics from Lily Lolo. They were all very happy with the web site, the value, and the goods! The positive comments regarding the web site are especially significant since some of these females are not very technology savvy!